Tonight we are celebrating Phu'c and Nicky's birthday so I volunteer to bring a few desserts for the evening. There are going to be about 50 people tonight so I thought it would be a good idea to make bite size desserts so everyone can sample an assortment of desserts instead of eating a large portion of just one dessert. 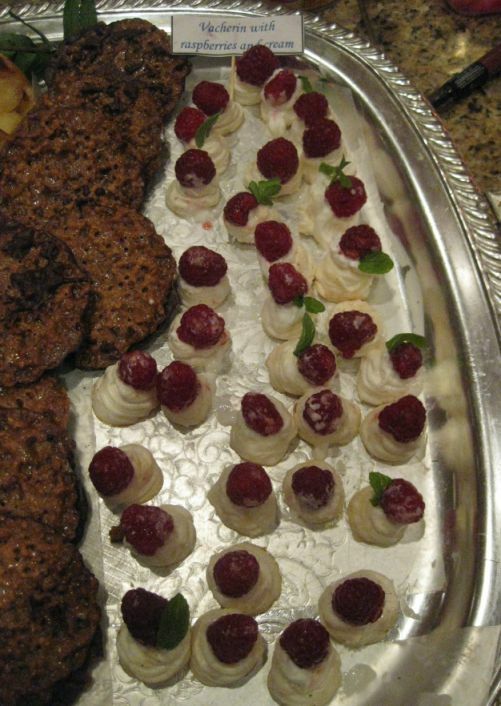 I am making 3 types of desserts: Vacherin with raspberries and cream, Chocolate Bouchon, and French Apple tartlets. But let's start with the Vacherin. Vacherin is a beatiful French dessert. It is basically a light crisp meringue that is so easy to make and you do not have to spend hours in the kitchen. 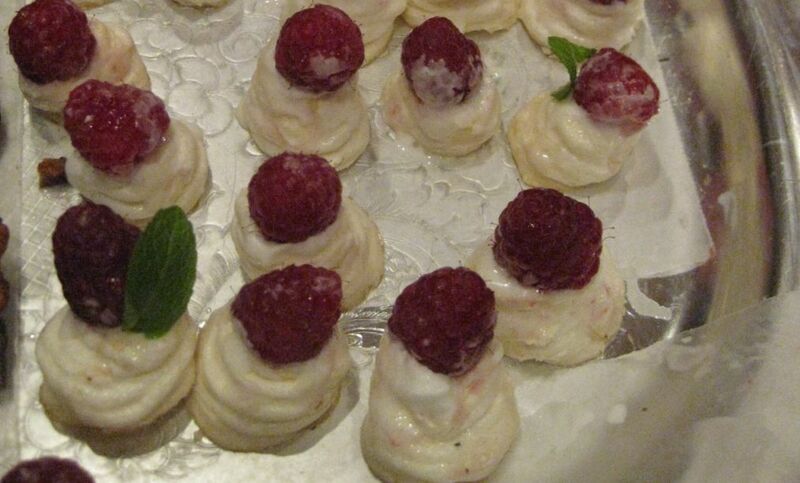 I paired the Vacherin with whipped cream and top it with a raspberry. 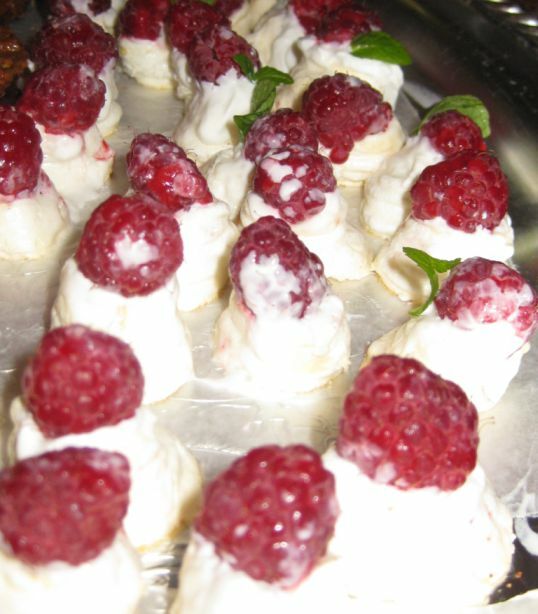 I really like the combination, the vacherin is sweep and crispy and the raspberries is a bit tart so it was a very good combination. A tray full of bite size vacherins. Close look at the vacherins. and whip until fluffy and glossy. It will take about 3 minutes or so. 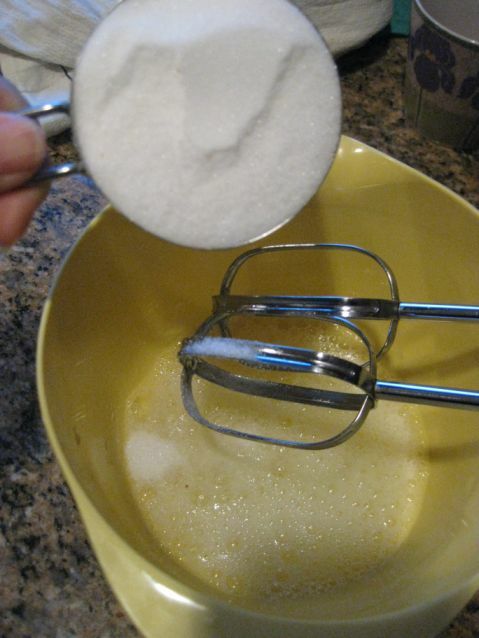 Add the confectioner sugar and whip very briefly for 5 to 10 seconds just to incorporate the sugar into the meringue. 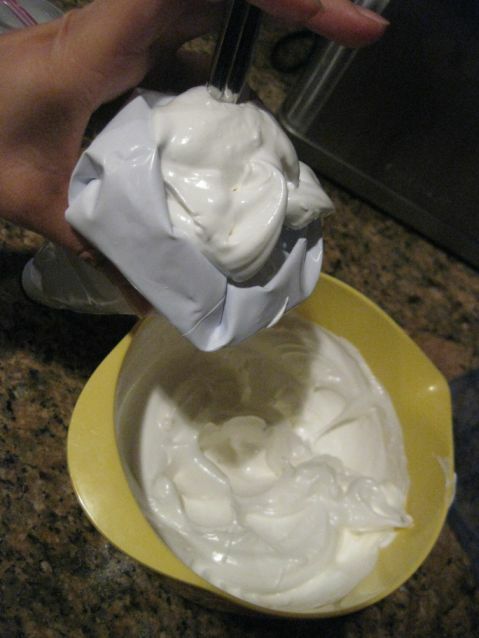 Next, spoon the meringue into a pastry bag. 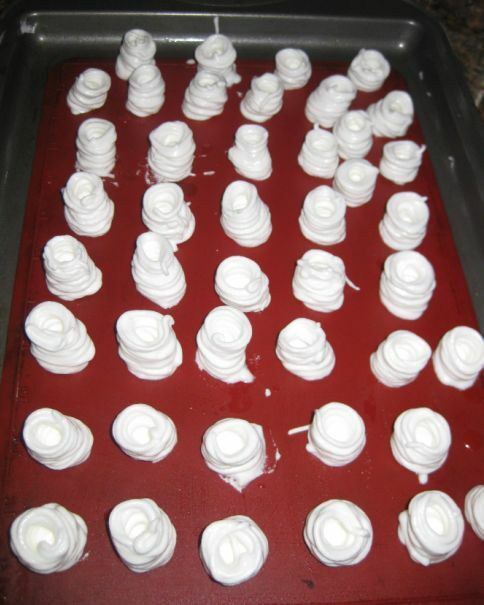 Pipe small round or base of meringue about 1/2 inch in diameter onto a cookie sheet, then pipe the meringue around the edge of the base and spiral upward and around a few more time, making tiny cup that is about 1 inch tall. 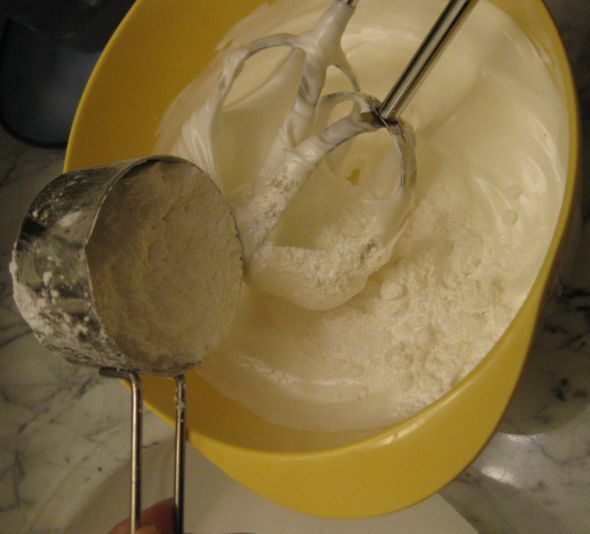 It might take some practice to pipe the meringue but if you make a mistake or they do not come out to the desired shape just scrape the meringue back into you pastry bag and pipe it again. Pre-heat the oven at 300 degree for at least 15 minutes then turn off and leave the door closed. 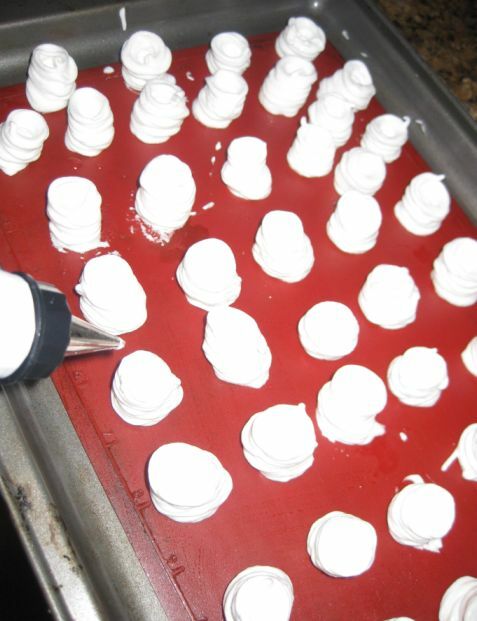 Transfer the tray of meringue in the turned off oven, close the door, and leave overnight until dry and crisp. 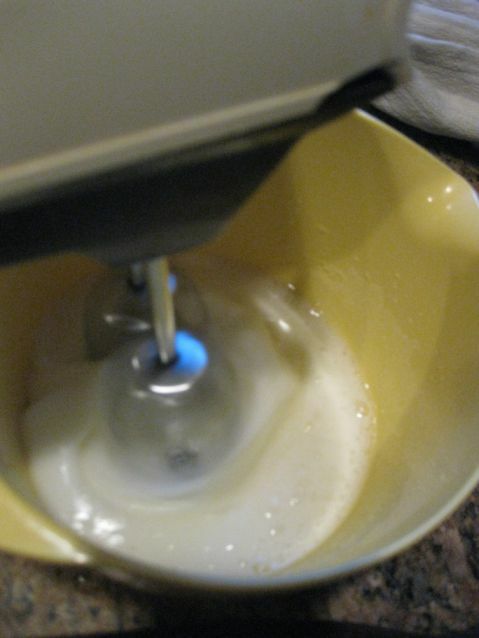 When ready to serve whip the cream and pipe or spoon it into the cups. Top each cup with a raspberry. Tuck a mint leave into each cup.